Congress president's letters to chief ministers of Chhattisgarh, MP and Rajasthan asks them to 'review the implementation' of the Land Acquisition Act. 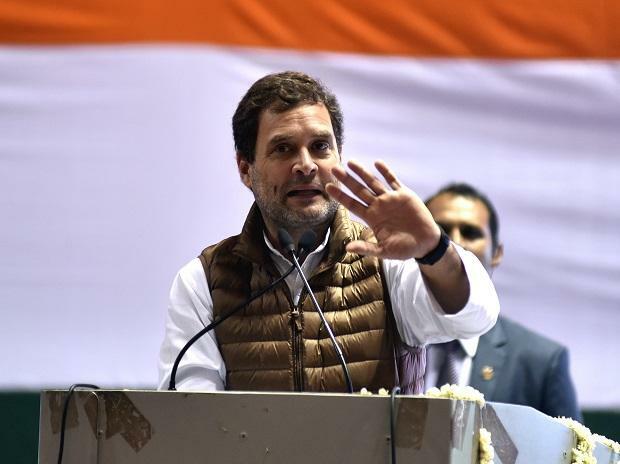 Congress President Rahul Gandhi has asked the party’s chief ministers in Chhattisgarh, Rajasthan and Madhya Pradesh to undo changes that previous Bharatiya Janata Party (BJP) governments in these states made to the land acquisition law and related regulations. Gandhi has written letters asking the chief ministers concerned to ensure that the rights of tribals and forest dwellers are fully protected under the Forest Rights Act, particularly in an ongoing case before the Supreme Court, where the petitioners have asked for eviction of tribals and challenging the validity of the law. Business Standard reviewed letters written by Gandhi to Chhattisgarh Chief Minister Bhupesh Baghel, Madhya Pradesh’s Kamal Nath and Rajasthan's Ashok Gehlot detailing his views on these two counts. “The Modi government tried to dilute the (land acquisition) law in 2015 by severely curtailing its provisions. It was forced to withdraw these amendments in the face of nationwide protests led by the Congress party. However, in a sleight of hand, the BJP government urged the states where it was in power to dilute the law through state laws, rules and practices,” Gandhi has written in separate but similarly worded letters to each of the three state chief ministers. “Previous government has issued notification/rules/guidelines/policy designed to dilute the rights conferred under the UPA’s 2013 Land Acquisition Act. I hope you would take steps for withdrawal of all such instruments, so as to ensure implementation of Right to Fair Compensation and Transparency in Land Acquisition, Rehabilitation and Resettlement Act 2013 in letter and spirit,” he added. A hearing was recently held in the Supreme Court case Gandhi referred to in his letter. The apex court, during the hearing, demanded reports from states on what action has been taken against tribals and other forest-dwellers whose claims over traditional forest lands had been rejected by authorities. The court’s orders came following pleas by the petitioners to evict those whose claims over lands had been denied. During this hearing while the court and environment NGOs commented on the lack of evictions, the Union government’s lawyers were absent leaving only a tribal group, which is party to the case, to defend the validity of the Forest Rights Act and prevent any orders favouring mass-scale evictions of tribals. Gandhi’s letters come at a time has accused the NDA government of standing as a ‘silent spectator’ while the Forest Rights Act gets challenged in the court. He had alleged that the absence of central government lawyers in the Supreme Court when the petitioners asked for mass-scale evictions betrayed the BJP’s intention to drive out lakhs of tribals and poor farmers from forests. On February 16, in a rally in Chhattisgarh’s Bastar district oversaw the return to tribals land which had been acquired by the state under BJP rule in 2008 for a Tata Steel project. The company withdrew from the project in 2016 citing difficulties. Ahead of the general elections, Congress party hopes to cement its pro-farmer and pro-tribal image by not only promising a minimum income guarantee and a farm-loan waiver but also reverting the country back to the original and undiluted form of the two land-related laws the party had legislated during the UPA’s two tenures. After the NDA government failed to amend the Land law through the Parliament it encouraged states to bring their own amendments or to pass rules and regulations under the law to suit their needs. Some of these amendments and regulations brought by different states, many observers have alleged, dilute the benefits derived by land owners and others dependent on land. Some of the changes by states also face legal challenge. Alongside one key provision of the land acquisition law, requiring return of land to owners if it is not used, also has faced several legal challenges in high courts and the Supreme Court. At the same time, during the last five years the NDA government at Centre and several BJP governments in the state have tweaked rules and regulations for the implementation of the Forest Rights Act, sometimes diluting the overriding powers that tribal gram sabhas were given to decide what is done with the traditional forestlands. The progress on handing over community and others rights over forests too has been tardy. In March 2018 this had led to farmers, particularly from tribal belts, march into Mumbai demanding their claims under the Forest Righs Act be settled immediately. The rally, with about 30,000 farmers and tribals walking to Maharashtra’s capital in an orderly fashion had led the state BJP chief minister Devendra Fadnavis to promise that all claims would be settled in six months. But many remain unresolved in Maharashtra and other states. Congress hopes to build on disaffection arising out of this faulty implementation of the two land laws to corner more rural votes in the upcoming Lok Sabha elections. Sources in the party said, Congress could contend with strengthening the laws further if need be, to protect against any legal challenge, if it comes back to power at the Centre. At the same time senior party government officials in one of the three states confirmed that work had begun to look at what changes the previous BJP government had made to the subordinate regulations and rules diluting the benefits people derived from the land acquisition law. “After a quick review, we should be able to correct it soon,” he added. With Congress trying to pitch the BJP as a party that has not come through on its tall claims, having the three large central Indian states under its governance has given the Congress an opportunity to prove that it acts quickly on the promises it makes. The fast paced moves towards the original form of the land acquisition law and enforcing the forest rights act is part of party’s attempt to bolster this image.